For the first time in twenty-six years, RWNZ’s conference comes to the South Island. The opportunity to showcase Christchurch brings with it a host of new offerings this year. This year, we’re giving our members who provide expertise and services for authors a chance to show their wares. So, if you’re a cover designer, an editor, a proof reader, a marketing guru, or anything else RWNZ need to hear about, fill in our expression of interest form and help us make our trade show a huge success. Watch this space for further information. Does your author headshot need updating? Looking for a professional social media profile picture? Appointments will be available with our photographer over the course of the conference. Kick off the conference with a bang and dust off those glad rags for A Night with a Billionaire Cocktail Party. The evening of glitz and glamour will feature a short opening ceremony to officially kick off Conference 2019, an introduction to our fabulous line up of speakers, agents and editors, a photo-booth with a billionaire and of course favourites like Frances Housden’s Annual Raffle and a free drink. 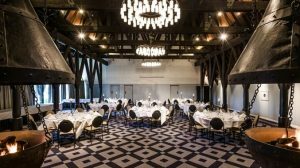 Let your hair down and network in the splendour of Chateau on the Park’s medieval banqueting hall. Love through the Genres: Conference Dinner and Awards. Our first South Island conference is something to be celebrated, and in this spirit of celebration we’d love to see you at the Conference dinner and Awards Ceremony as we celebrate the success of all things RWNZ. The theme is Love Through the Genres, so come dressed in the genre you write, or your favourite genre or just wear your glad rags—Genre props will be available for photo opportunities and we’ll have activities and spot-prizes that will keep everyone entertained all evening. One of the best things about RWNZ is the incredible support network it offers for authors. During its twenty-six-year history, it’s seen many of the country’s most successful authors emerge. As a result, we want to celebrate with a rolling presentation and we need your help. We want to know your RWNZ stories. When did you join and why? Have you held a volunteer role? Have you ever won an RWNZ Contest? When did you first publish? When was your first conference? When did another member give you just the help you needed? Any story, large or small, we’d love to hear it.